GAAPWatch is a web-based software application which helps accountants, auditors, financial analysts, SEC filers, and other business professionals make use of public company financial information reported to the US Securities and Exchange Commission. GAAPWatch always has the most recent public information: reporting entities and disclosures are automatically updated as each company files with the SEC, usually within minutes of filing. Start with a free 30-day trial. Subscriptions start at just $9.99 per month. 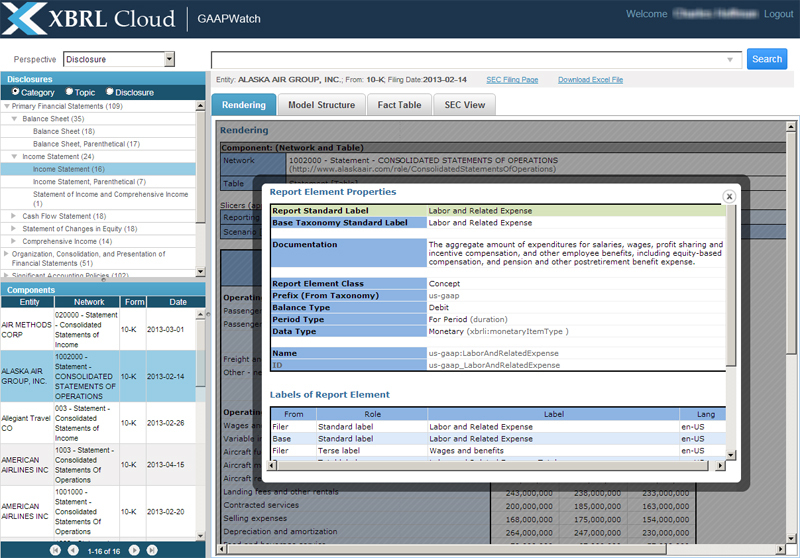 GAAPWatch is unique in that it lets you interact with financial disclosures of reporting entities both by reporting entity but also by disclosure. The notion of a “document” is removed from the equation providing unparalleled flexibility to the user. Below is the “Entity” perspective which allows the user to pick a reporting entity on the left and view information about the disclosures of that reporting entity on the right. Note that “Entity Groups” provides a number of system defined entity groups such as “All Entities”, the “Dow 30” and the “Fortune 100”. The user can create “Custom groups” of entities for say your peers or any other grouping. Information about any “Form” filed with the SEC which uses the XBRL format and any “Component” of that report can be worked with. On the top right you will notice the “SEC Filing Page” link which takes you to the filing on the SEC web site. You can also download the entire filing in Excel by clicking “Download Excel File”. You can also have a look at the entire financial report in the XBRL Clould Viewer which allows features that allow you to explore an individual financial report, change a report component’s configuration, etc. The utility of GAAPWatch can really start to be seen when you use its Disclosure perspective. Look closely below and you will see that on the left, GAAPWatch is providing an organized list of financial report disclosures. 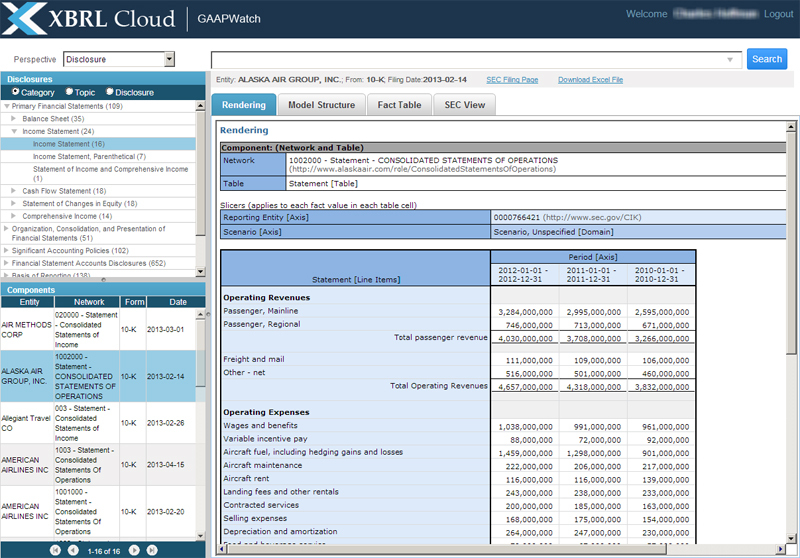 In this example, in the “Components” view you see the list of “Entities” which are, in the example we are showing, in the “Airlines” industry. The “Income Statement” Is selected. When you click on any entity in the list on the left you see their income statement on the right. Click on another reporting entity, you quickly and easily see that entity’s income statement. Disclosures can be organized in a tree by “Category”, or they can be shown by “Topic”, or they can be shown in a simple list. The reporting entities you are working with can be filtered in numerious ways, we will get to the details of that in a moment. On the right notice, that you have a variety of view of the information including the “Rendering” view which is generally the most useful, but you also have the “Model Structure” view, the “Fact Table” view, and “SEC View” which shows you what the SEC XBRL financial filing looks like in the SEC interactive data viewer. With GAAPWatch you have a powerful set of search and filter functionality which lets you specify very precisely the reporting entities which you want to work with. You can also specify the name of any reporting entity and go right to that entity’s information. For example, if you notice on the left you see 16 “Income Statement”s. Within the red box you see blue checks. We have specified that we don’t want to see any reporting entities which are not going concerns, we want no developing stage entities, we want no trusts or funds, we want only reporting entities within the subindustry of “Airlines”, we want the fiscal year “2012” and the document type of “10-K”. Other common reporting entity filters are provided. GAAPWatch provides you with visibility into all the details. Click on any reported fact or any concept or characteristic and you will see all the detail you need to understand what the reporting entity is trying to articulate. This same detail is available in the “Model Structure” and “Fact Table” views which are helpful in trying to understand SEC XBRL financial filings. One of the primary features of GAAPWatch is something which you don’t see. It is something you never have to be concerned with. As new filings come into the US Securities and Exchange Commission, GAAPWatch is updated for those newly submitted filings automatically. No installation, no system updates, no data updates: All the filings, all the time. Need more from public company filing information? Watch for GAAPWatch Pro which is coming soon. While GAAPWatch provides you with the report components of a financial report, GAAPWatch Pro lets you get into the details more. Do comparisons between report components, build comparison models, have a look at business rules, verification results, slice and dice companies by fundamental accounting information, and other useful functionality. Sitting behind GAAPWatch, which is a cloud-based software as a service application, is the XBRL Cloud Edgar Report Information Service which is a REST-based web service API which provides an interface for use of public company financial information provided by the SEC via XBRL. Free 30 day trial – The best way to see if GAAPWatch is for you is to kick the tires. 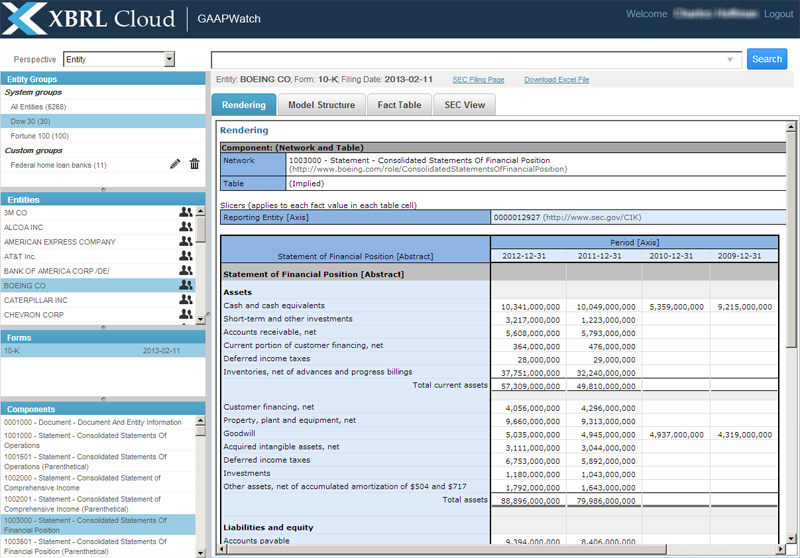 So, XBRL Cloud offers a free fully functional 30 day trial of GAAPWatch. No training is necessary; GAAPWatch is really that easy to use! $9.99 per month, basic single user – A license to use GAAPWatch is just $9.99 per month, paid in full for a year (i.e. you pay for the year in full up front). Pricing for large groups of users – Enterprise pricing is available. Call XBRL Cloud for more information. White label branding – GAAPWatch can be branded with your logo and can be customized to look like your application. Call XBRL Cloud for more information. Embed GAAPWatch in your application – Because GAAPWatch is really a very simple application built on top of the Edgar Report Information Service it is trivial to add pieces of GAAPWatch or the entire GAAPWatch interface into your software application. Using GAAPWatch with your information set – GAAPWatch leverages the global standard XBRL and therefore will work with other information sets. Same for the Edgar Report Information Service. There is no need to build custom solutions when you can just put the web service and the end user application on top of your information set. All you need to do is change some metadata. It is really that easy. Call XBRL Cloud for more information. GAAPWatch Pro – GAAPWatch Pro provides additional functionality beyond that offered by GAAPWatch. Pricing for GAAPWatch Pro is not yet set. Call XBRL Cloud for more information. The era of digital financial reporting is here and GAAPWatch provides accountants, analysts, attorneys, and other business professionals an easy way to leverage the power of those digital financial reports. The usefulness of the SEC XBRL financial reports will do nothing but go up. If you are a reporting entity, what a great way to compare your XBRL-based financial information to that of your peers than using GAAPWatch? 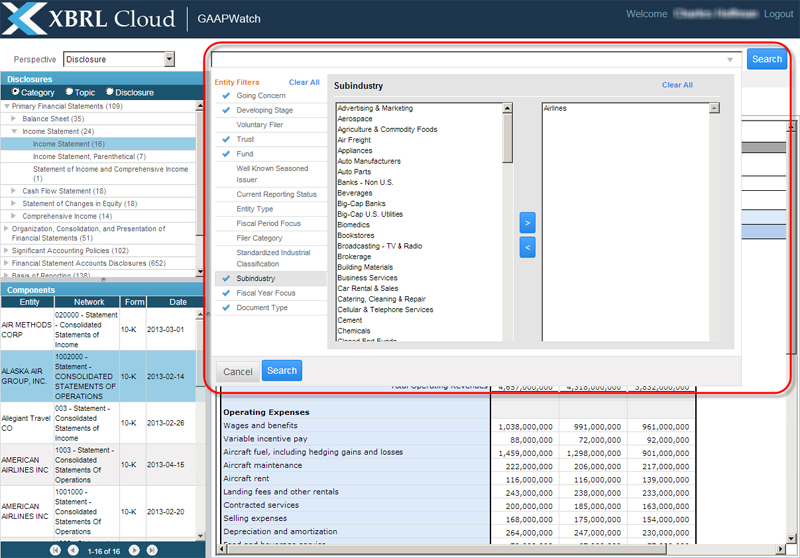 Contact XBRL Cloud to get more information about GAAPWatch or any of our other products which help business professions and software developers leverage the power of digital financial reports. Experience the magic of the underlying technologies without having to understand any technical mumbo-jumbo. Give it a test drive to experience the magic for yourself. Copyright © 2018 XBRL Cloud. All rights reserved.